Showing the areas of over- and underexposure on the image. Automatic setting of positive (lightening) exposure adjustment. EV0 – the level that corresponds to the middle gray. If exposure adjustment has not been applied, it’s set to 3 photographic stops below the saturation level of a camera. -5 – the level that corresponding to the level of the underexposure indication (see below). +3 (when exposure adjustment is turned on it can be +2 or +1) – extreme highlights. The leftmost mark of the scale is the level that corresponds to the value of “1” in the RAW data. 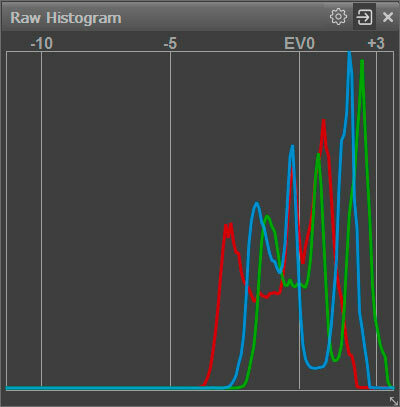 The histogram step on the horizontal axis is 0.1EV, so there will always be a “comb” in the shadows, as there are less possible levels than 10 levels per stop. When applying exposure adjustment (see below) the histogram itself does not change – instead the horizontal axis shifts. During a positive exposure adjustment, the EV0 level shifts in the direction of the shadows (because the shadow sections shifts to brighter ones – closer to middle gray), correspondingly the other vertical marks move as well (and if needed, the numbers for the marks change as well). During a negative exposure adjustment, the axis shift is in the opposite direction. With this, the underexposure level indicator stays in place because the quality of the shadows doesn’t change with the change of exposure compensation. For RAW data, the exposure statistics are calculated for each channel. These statistics are displayed in the Exposure stats panel, which by default is located in the right side of the program window. Underexposure (UnExp) is 2.45% in the Red channel, 0.29% in the Green channel, and 1.78% in the blue channel – those pixels are in the underexposure zone, that is 8EV (with standard settings) below the saturation point for the camera. 8EV is a standard value for the photographically usable dynamic range. You can change it to match your particular camera through Preferences – Image Display - Exposure – Underexposure detection limit. If positive exposure compensation was applied to the image the table may contain an additional column OE+Corr, indicating the number of pixels, which will be above the maximum value after the exposure compensation is applied. After the positive exposure compensation was applied as in the shot above, 10% of “green” pixels are above the maximum, most probably because the value of the exposure compensation is a little bit overboard. For a fast review of a significant number of files, it may be convenient to keep the OE+Corr column always on. This way, you won’t be distracted by the changes in the size of the panel. This can be done by going into the Exposure Stats panel’s settings (gear icon) and checking Always display OE+Corr column. The over/underexposure areas can be identified using a colored overlay. Magenta – areas where the green channel is clipped. Cyan – areas where only the red channel is clipped. Yellow – areas where only the blue channel is clipped. Blue – areas where both green and red channels are clipped. Green – areas where both blue and red channels are clipped. Red – areas where both blue and green channels are clipped. For this image, we see the blown-out green channel on almost the entire sky over the sand dune; while on the central portion of the sky the blue and green are both blown out. More likely than not, recovering the sky’s tone normally via Highlight recover won’t be possible. With standard settings, the positive exposure adjustment has the effect on the overexposure area display: the areas shown are the ones that would be overexposed, if we had taken the shot with this exposure compensation on the camera. This behavior can be changed by turning off the setting Preferences – Image Display - Exposure – Exposure adjustments affects OverExposure display, in this case only those areas that are overexposed (clipped) in the RAW file itself will be shown as the overexposed areas (obviously, the exposure adjustment in FastRawViewer has no effect on the content of RAW files). Blue – where the blue channel is underexposed. Red – where the red channel is underexposed. Green – where the green channel is underexposed. Magenta – where both red and blue channels are underexposed. Cyan – where both green and blue channels are underexposed. Yellow – where both green and red channels are underexposed. Exposure adjustments do not affect the display of underexposure areas (or underexposure statistics). For this shot, part of the foreground is underexposed; also, one can see areas with the red channel underexposed (red), and, also areas where both red and blue channels are underexposed (magenta). Planned shadow boost in the current shot. 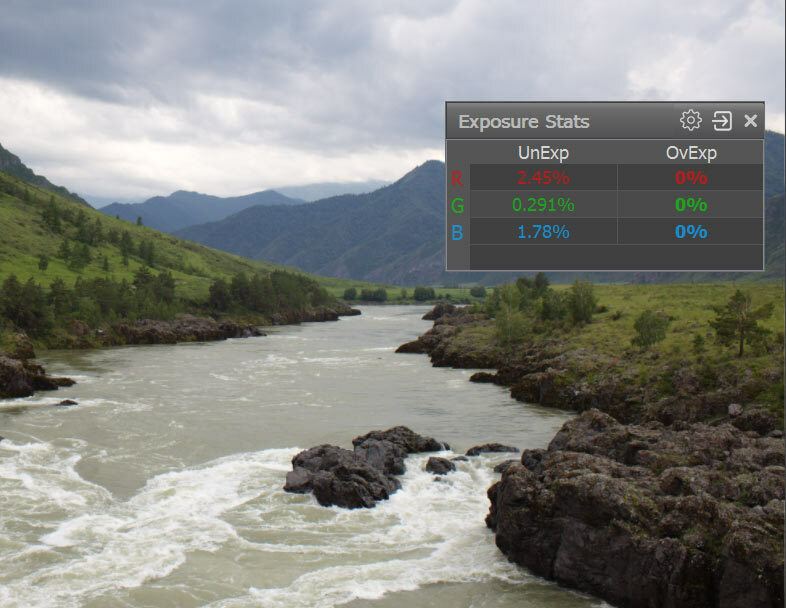 In FastRawViewer, the limit that controls the underexposure warning is set by the user themself in the preferences (Preferences – Image Display - Exposure – Underexposure detection limit). The default value (8EV) is fairly conservative, and works pretty well for low ISO settings, 100-800 ISO. In the case of using high ISO, or strict demands to the image quality, this parameter may to be set lower (to 6-7EV, and sometimes even lower), according to the technical requirements for the resulting image. 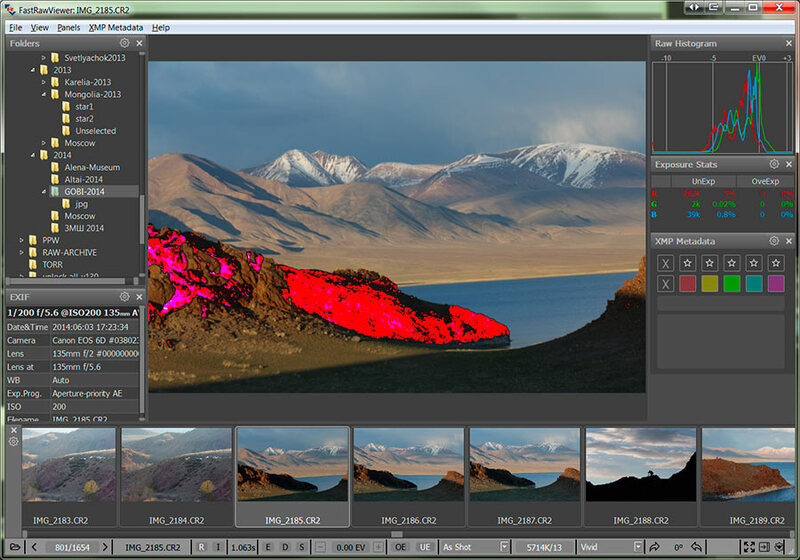 By default, an exposure correction equal to the one that is automatically applied by Adobe converters is also applied when a RAW file is opened in FastRawViewer (for more details, please see https://photographylife.com/adobes-silent-exposure-compensation). 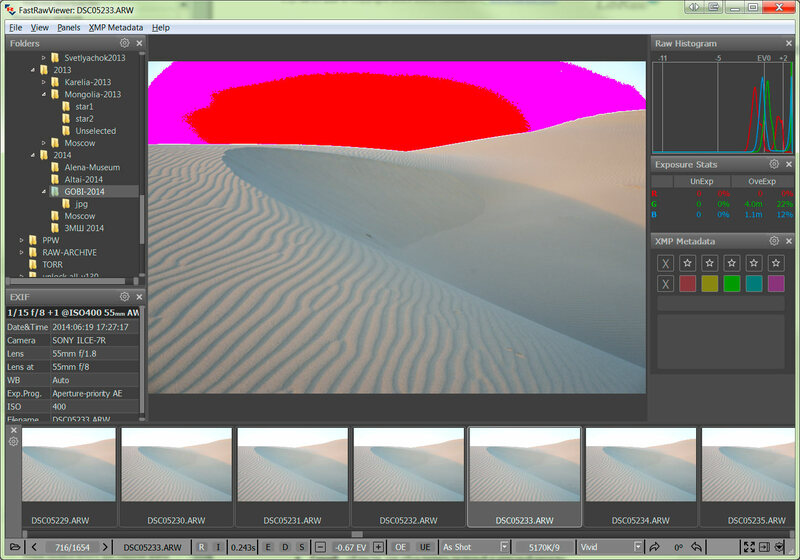 As a result, the overall brightness of the rendition on the screen is a close match to a JPEG preview; and, given the contrast curve in Preferences is set to 'Variable Contrast' and contrast is set to default, it also matches the rendition in Adobe converters with all the sliders there being set to '0'. The application of this standard exposure offset can be switched off via Preferences – Image Display - Exposure – Apply Adobe hidden exposure correction. If Shift-A is pressed, or Menu – Adjust – Auto Exposure Correction is enabled, FastRawViewer calculates and applies automatic exposure correction in such a way, that 1% of the total amount of pixels in the image are pushed to saturation (receive the value of 255 on the 8-bit scale). Fixed shift by the given amount of stops (EV), the value is controlled through Preferences – Image Display - Exposure – Auto Exposure – Fixed Exposure shift. Automatic calculation of the exposure compensation to shift the histogram ‘to the right’, controlled through Preferences – Image Display - Exposure – Auto Exposure – ETTR-style autoexposure (shift histogram to the right). Saturate up to NN% pixels – controls the per cent of the pixels that will reach the saturation as the result of the automatic exposure correction. Hard limit – no more than the number of stops set in this field. If the shot was taken at ISO in-camera setting higher that this limit, the maximum exposure correction is 0. (in stops, EV) between the ISO setting in the camera and the limit set (for example, if the limit is set to ISO 6400, and the shot was taken at ISO 1600, the maximum amount of exposure correction is 2EV). To switch off the exposure correction, making it 0 (or, if Apply Adobe hidden exposure correction is ON, making it equal to that value of hidden correction), press the ‘A’ key on the keyboard. Second press of ‘A’ will restore the previous correction. Increase exposure adjustment: Menu – Adjust – Adjust exposure correction – Increase Exposure (Alt-Plus/Alt-Shift-Plus keys) or the + button in the lower bar of the window. Shift-Click on bottom bar button will use larger step. Decrease exposure adjustment: Menu – Adjust – Adjust exposure correction – Decrease Exposure (Alt-Minus/ Alt-Shift-Minus keys) or - button in the lower bar of the window. Shift-Click on bottom bar button will use larger step. The amount of exposure adjustment change per click / key press can be set through Preferences – Image Display - Exposure – Manual Exposure step size for small/big steps separately. Exposure adjustment is recorded in XMP-file in the FastRawViewer format (if reading/recording XMP is on). Moreover, exposure adjustment in a format that is compatible with Adobe (Bridge, Camera Raw, Lightroom) is recorded in XMP as well. This recording can be turned off through Preferences – XMP – Adobe Compatible Exposure and White Balance. If the value of the exposure correction can be read from an XMP file (the priority is given to the value recorded in FastRawViewer format, and if it is not found, we take the value from the record in Adobe format), it will be applied when the file is displayed. No correction (default) – exposure correction is not applied. Autoexposure – Automatic exposure correction will be applied, according to the respective settings for this type of correction. Keep from prev. file – same value of the exposure correction, as it was set for the previous file is applied. If the file is the first one opened during this session, no exposure correction is applied.